Jaipur or Pink City - is a must when in the area. Fantastic Amer Fort has to be experienced and is really worth the trip alone - but also the sights downtown Jaipur and the Castle in the Sea are special and very nice. My whole trip went smooth and according to schedule - very early pick up at the Delhi hotel, parked in a train seat and picked up outside the Jaipur train station by guide Charlie and driver Harish. Both very skilled, friendly, service minded and who very much met my expectations of the day. A special thanks to Harish who fulfilled my special wish at the end of the day. I highly recommend this trip to Jaipur from Dehli. It was a nice day trip, though the express train was not exactly 'express' with a delay of about 40 minutes. This slightly reduced the amount of time we had to explore the city itself. Our tour guide did his best to optimize the time we had and took us to the most iconic places. We felt quite exhausted by the end of the day from the long hours of travelling. 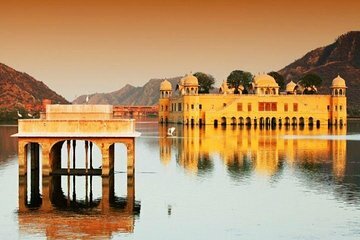 Overall however, I would recommend this trip for those who are short of time and would like a quick overview of Jaipur and its main attractions. We enjoyed our day trip to Jaipur from New Delhi. Asif from the agency kept in close contact prior to, during, and after the trip about the details and made sure everything was taken care of. We wanted to take the train once during our stay in India, and having the drivers show us exactly where to go in the train stations was helpful. The guide Mr. Sharma and the driver Ajay in Jaipur were professional, courteous, and accommodating. We were able to see the sights we wanted to see Amer Fort, Jaipur City Palace and had a little time to shop before boarding the train back to New Delhi. Two things we wished we had known before the trip: 1 There is a train station named Gandhi Naga Jaipur prior to the destination Jaipur. Don't get off at the wrong station. 2 The admission fees to the sights are not included in this package. Tour guide was excellent. He had detailed knowledge of the city and presented it in a manner that made it interesting and memorable. The tour pace and opportunity to ask questions and take pictures were great. It is a long day as the train trip is 4 hours each way and there are so many interesting places to see. Make sure you have comfortable walking shoes. Only hiccup was with the train travel, when I got off at the wrong Jaipur station. I would recommend that the tour organizers make it clear where to get off the train in Jaipur. Otherwise I would give it 5 stars.